Cognoscenti 76 : Urbino – centre of the Renaissance? Surely Florence is THE Renaissance city? This was the first question asked when the Cognoscenti Renaissance City tour was first advertised. That seems long ago; now the case for Ferrara and Urbino is solidly made, the tour is full and we are off there in a few weeks. But now we are in the final stages of planning the World of Piero Della Francesca, a 2016 tour, which will be on sale very soon, and the question arises once more. If the principal works of Piero were to be seen in Florence, and those of Botticelli at San Sepolcro, I do not doubt that the public estimation of these two masters would be reversed. Artistic English spinsters would stand in rapturous contemplation before the story of the True Cross, instead of before the Primavera. Raptures depend largely upon the stars in Baedeker, and the stars are more freely distributed to works of art in accessible towns than to those in the inaccessible. That was Aldous Huxley in 1925 (this text is further quoted in another Cognoscenti post). Of the three known perspectives made within the circle of Piero della Francesca in Urbino in the later 15th century, often called (perhaps by those who feel people get in the way of fine architecture and urban spaces) “ideal cities”, this is the one which remains there. The ducal court of Urbino hosted a rather different ‘Renaissance’ from Medici Florence. As the eminent art historian John White noted, rather more recently than Huxley, ‘the patent on the history of art was taken out in Florence’. The chief culprit was Giorgio Vasari, a poor painter, a pedantic architect and the wrecker of Florentine Gothic, but celebrated for being the author of a hugely influential work celebrating the supremacy of Florentine art, Lives of the Most Eminent Italian Architects, Painters and Sculptors, published in 1550. For Vasari followers, art had been rescued from its dismal mediaeval abyss by the talents of Florence. In his narrative there was little room anyone else; there are the key Venetians, but virtually not a hint of Duccio or of Siena. While the reputation of Florentine art is of course unassailable, Ferrara and Urbino as centres of Renaissance humanist scholarship and culture were every bit its equal. Moreover, the motto of Cognoscenti tours is always to head for the paths less travelled in our 21st Century – and every art-loving traveller can reach Florence on their own with their eyes shut or at least by ticking a box in a weekend newspaper’s small ad. What has been called ‘Vasari’s Florentinocentrism’ led naturally to the Art History Industry, to the 19th century cultured Englishman abroad, to I Tatti (Bernard Berenson’s Florentine ‘lay monastery’ for the leisurely study of Renaissance culture) and even to A Room With a View. The English view of the Renaissance has always been through a Florentine window. But next month on the Renaissance City tour we will be more intrigued by what it was that encouraged the artists and the thinkers themselves to swarm at the different courts of Montefeltro and Este. And next year with the World of Piero tour we will follow Huxley’s footsteps and, despite Piero’s star having risen far since he wrote those words, we will still find we may have these wonderful masterpieces, which could not be grabbed by the Brera or Ufizzi, more or less to ourselves. 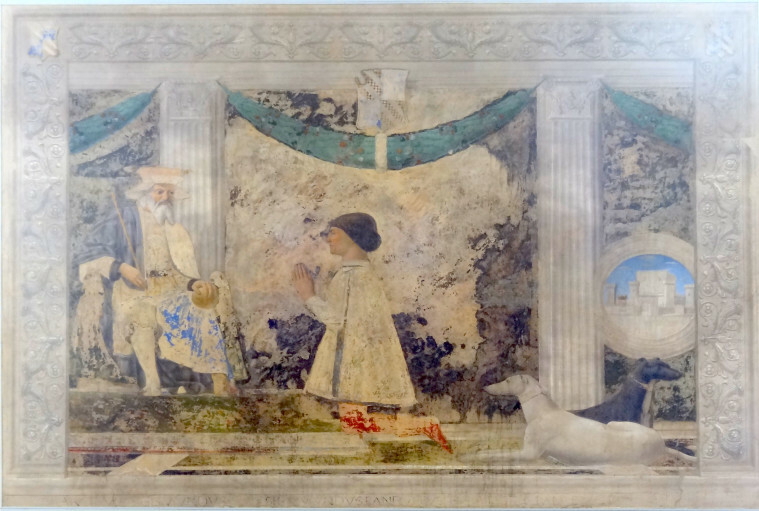 As a slightly different coda, here is my recent snap of a Piero painted on – damaged but, again, not removed from – its original wall in Rimini, where the Renaissance City tour will see it shortly. It’s not called The Dogs of War and Peace.